I am thankful that Family Friendly Gaming purchased No Man's Sky on the Playstation 4 for this preview. I remember the claims at E3 2015 concerning this game. We could go and see all of these planets, and claim them as our own. There was this vast galaxy to explore. There was all of this diversity among the planets. It would be an endless epic exploration that was nearly endless. The final product does not match the companies claims. We received emails denoting the scandal surrounding No Man's Sky. We decided to spend massive amounts of money purchasing this game. We over spent on No Man's Sky. Wait for this game to drop to twenty dollars brand new at most. Early on I got lost in No Man's Sky. I eventually found my way back to my ship. I learned that flying close to locations made much more sense. The bulk of my time in No Man's Sky was collecting resources, and crafting items. I also noticed planets started looking the same really fast in No Man's Sky. The lack of understanding the language and having to do so much to learn it was a major chore. 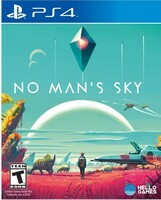 If I knew nothing about the promises No Man's Sky would be an average gaming experience. I plan on having a review for No Man's Sky in issue #112. Playing this game was an interesting experience. It gets dull and boring with having to constantly collect resources to power up everything from the vehicles to the shields.